Creative Sisters students had their artwork judged against some tough statewide competition and came out winners. This year, there were about 7,000 entries in the Scholastic Art & Writing Awards in Oregon. Sisters students will be celebrated at an Awards Ceremony Saturday, February 9, at 1 p.m. at Central Oregon Community College. 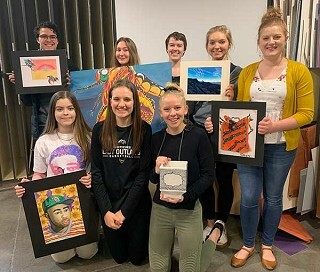 Then the 400 art pieces from Central Oregon students will remain on display at the Pence Pinckney Art Gallery at COCC through March 1. The six Gold Key recipients have their art sent to National Judging with results released in March. "I continue to find the Scholastic Art and Writing Awards to be a valuable experience for students because it gives them validation for their creativity and hard work in a typically behind-the-scenes passion, connects them to a greater art community, and gives them real-life experience in the world of submitting their art for judging. The show this year at COCC is just as inspiring as ever. Wish our Gold Key recipients luck as their work is forwarded to national judging!" said Bethany Gunnarson, Visual Arts Teacher at Sisters High School. Submissions were judged by a panel of artists, educators and creative professionals. Artwork is judged based on originality, personal vision and technical skills. The numerous categories include sculpture, ceramics, jewelry, photography, fashion, and digital art. The Painting and Drawing & Illustration categories are the most competitive.  Gold Key: True Duerden, Sierra Henneous, Grace Maiden, Hailey Mosca, Jack Ogan, Katie Springer.  Silver Key: Maddison Anderson, Josie Aylor, Ella Cole, True Duerden, Sierra Henneous, Delia Hoyt (2), Hailey Mosca, Addy Myhre, Jack Ogan, Katie Springer.  SHS Honorable Mention: Josie Aylor, Arden Crosier (2), Meaghan Greaney, Delia Hoyt (3), Spencer McKeown (2), Lexie Miller.  Honorable Mention: True Duerden for Poetry, Katie Wearn for Flash Fiction and Poetry.  Silver Key: Hailey Asson.  Honorable Mention: Elana Mansfield, Evan Martin, Monserrat Mendoza, Caitlin Quam, Matthew Riehle, Lilly Sundstrom.